Art is a great way for children to let their imaginations run wild, using colours, shapes and different materials in creative ways. 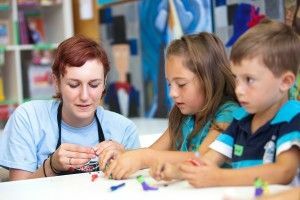 And thanks to a new art studio called 4Cats, children can develop their artistic skills while learning more about art history. 4Cats was started by a mother in Victoria, BC who used art to help her son, diagnosed with learning disabilities, to express his thoughts and feelings. She realized that children were very keen to learn about the lives of artists and how they actually created their artwork. So she started 4Cats, which now has studios across Canada and in the United States. During the 13-week sessions, participants will learn about the life and work of two artists and then make art inspired by them. In the fall, the featured artists will be Andy Warhol (surprising fact: he had 25 cats named Sam) and Vincent Van Gogh. Classes are open to children ages 2-15; participants will be grouped by age. The 4Cats studio also hosts art-themed birthday parties, where guests spend an hour making art and then about 45 minutes opening presents and eating cake. The studio is located at 5026 Parc Ave. in Plateau Mont Royal. Kids get to work in a variety of mediums, taking inspiration from the works of famous artists. If we are studying Andy Warhol, we silk screen and make ink blot paintings. If we are studying Picasso, we create acrylic on canvas cubist paintings and ceramics, if we are studying Frida Kahlo, we make paper-mache and paint acrylic on canvas self-portraits. You get the picture! We throw in a lot of age-appropriate art history! Did you know Andy Warhol had 25 cats named Sam? Did you know Georgia O’Keeffe ate dirt? Did you know Leonardo da Vinci wrote his notes in secret code? Curators tell captivating and inspiring stories in a fun and humorous manner about the life and work of the artist being introduced. Art classes for ages 2 and up!